You Get More With Alter Ego! Join the best rewards program in the industry. What Are People Saying About Alter Ego? "Thank you all very much for your no-hassle great customer service! Every time I order from your store or have any questions or concerns, you've been just spot on with being courteous and quick to replies to my emails. Many thanks to you for taking that extra step when it comes to customer satisfaction." "I just wanted to let you know that I am completely satisfied with my recent order. Everything shipped perfectly fine and i wasn't expecting the double boxed shipment. This makes me ask myself why i've been shopping with Sideshow for so long. Thank you. You'll be getting more orders from me in the future!" "Almost ten years ago I placed my first order with Alter Ego - I put it on my credit card with a $500 limit, wasn't paying attention to my balance, and the charge was denied. You called me directly and gave me a chance to make good on it instead of just cancelling the order. I was grateful, surprised, and impressed. Having worked in retail my whole life, I know putting the customer first is not often easy, and is sometimes not even the right thing for the business. You and the whole crew, especially your singular female employee (her name escapes me at the moment!) really to an incredible job as a small business, compared to any other business in ANY field. You provide unparalleled service and are constantly improving, often going to your customers for advice about what THEY want. Seems obvious, but I can think of very few that follow suit. You have a customer for life, not neccesarily because of what you sell, but wholly because of the experience you consistently provide. A thousand times "thank you", and big respect to your whole crew." Hi! 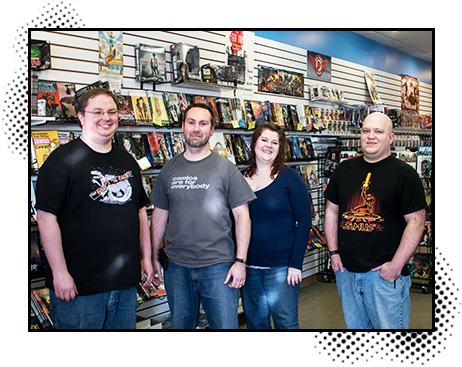 We're the staff of Alter Ego Comics...That's us in the picture (Marc, Amanda and Alex). We may be small, but we're mighty and we've been doing this since 2003. We're fans, customer service ninjas and we're real. I assure you we're real...and we're spectacular! Got questions? Call us at 419-224-6700. You won't get a machine. You'll get one of the four of us. Ok, it'll probably be Amanda, because she's got the best phone voice.